Spun Sugar Quilts: A Christmas Fabric Giveaway. Yep it's giveaway time, continue reading to find out how to enter. I adore making Christmas gifts. I know, I know, how on earth could I be thinking of Christmas right now? Well with all the newest Christmas fabrics being released lately it's got my wheels spinning. 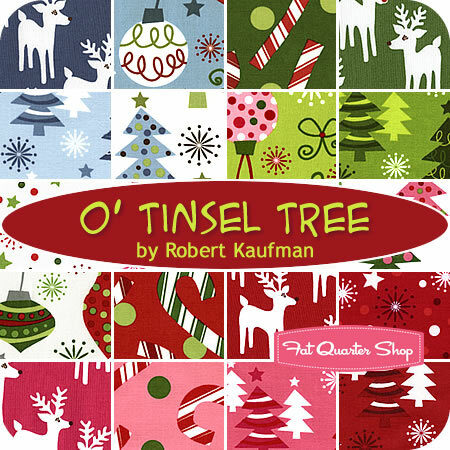 O'Tinset Tree by Robert Kaufmann. 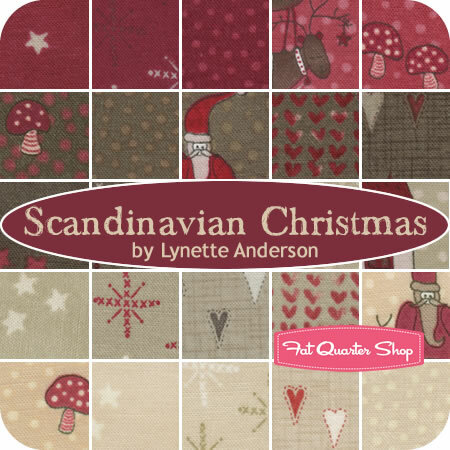 and Lynette Anderson Scandinavian Christmas. There are THAT many that I'd like to use. All will be available at the Christmas Cloth Store soon. I've got to hand it to the 'buyers' of Fat Quarter Shop because they have quite an extensive collection of prints. It ranges from batiks to novelty. I have never seen so many Christmas prints available on one site. Anyhow, I know that with the price of fabric, our gas and ecomony...money is tight for many. In the spirit of giving I thought that one of you would like some Christmas cheer to boost your handmade holiday. a bundle of MY favorite Christmas fabric line this year. Now how could you win a bundle too? and guess which one is my favorite. I will compile all the correct guesses and draw a name for the bundle. You HAVE to guess which bundle exactly. I will close the giveaway on the morning of May 2, 2011. (I have prior commitments that week so blogging may be delayed, but fear not, a winner will be chosen). What fun! I'm going to guess Deck the Halls by HMP. Lots of goodies in the FQS link! I'm guessing countdown to Christmas by sweetwater. Thanks for the fun giveaway! My guess is the Over the River fat Quarter bundle. Wow, this is tough. It is hard enough to pick just one to my own favorite, but trying to guess yours too. I need extra coffee... I think you probably like Deck the Halls by HMP. Wow, this is hard! I will guess "I love snow" from Shelly comiskey! That's a hard guess - Countdown to Christmas. Wow, that's really hard. There are so many gorgeous fabrics. My guess will be O' Tinsel Tree by Robert Kaufman Fabrics. I'm guessing Ready, Set, Snow by Me and My Sister Designs! Thanks for the christmas peek at the FQS, I can see I'll be doing some shopping soon! My guess is Holiday Kumari Gardens. I think there are sew many pretty fabrics!!! I think maybe Flurry by Kate Spain. My guess is Countdown to Christmas! I can't believe the holiday lines are already out!! Spearmint Funky Christmas is my guess!! P.S. Please, save my curiosity: is my analyse right? I'll guess Christmas Candy although it isn't available yet.. I'm crushing on it.. If I were picking my favorite it would be Flurry by Kate Spain. I just love it! Hope it's your favorite too. Since my favorite is Flurry, I am guessing it is your favorite also. I had no idea there were so many! I would say Flurry by Kate Spain. Hmmm... So many to choose from. And its always harder trying to guess someone else's pick... I'm going to guess Flurry by Kate Spain. I know I love it! I think Flury by Kate Spain! My guess is "Ready Set Snow" by Me and My Sister Designs. I'm going to guess Countdown To Christmas. I'm going to guess Holiday Kumari Gardens. There are so many choices and you appear to be a quilter of many moods...but I am going to guess Deck the Halls. Hmmm, Flurry by Kate Spain maybe? I just added about a half dozen of them to my birthday wishlist! Christmas fabric is my most favorite. I sewing Christmas projects during summer. I'm guessing O'Tinsel Tree.....That is my favorite. These fabrics stopped me in my tracks. I'm thinking Flurry....am I right?? I'm going to guess Jovial by Basic Gray! But there are so many cute ones, it was difficult to pick one! I'm guessing Ready, Set, Snow. I'm going to bet on Deck the Halls, but how can you have only one favorite???? Tough one! Making us work. LOL!! I'm going with Kate Spain - Flurry since I can't decide. I'm torn between 2 that I think are your favorite. I can't believe there are so many Christmas fabric lines this year. What a choice to have to pick one. I think your favourite might be "Holiday Kumari Gardens". I'll guess "Deck The Halls"! Ready, Set, Snow is my guess...but this is an unfair contest...too many choices! Ha! Ha! And now I am having a hard time finding my favorite, too. Thanks for a chance to guess and hopefully win. I think over the river is your favourite but how on earth can you choose just one! I can't believe how many lovely Christmas fabrics there are at FQS. I have no clue--but my guess would be Scandinavian Christmas because it's different from all the rest and would be a welcome change. Spearmint Funky Christmas is my favorite--hope you like it, too! MY guess would be Winter Solstice by Jason Yenter. I'm going with Over the River - thanks. What fab fabrics! I'm going to guess Spearmint Funky Christmas (although I think you'd like Grace, too). Maybe because that's my favorite. There's just too many great Christmas fabrics out this year!! I'm going with Peace Winterberry Lane Fat Quarter Bundle Whimsicals for Red Rooster Fabrics! I guess Ready Set Snow by Me & My Sister. I have no idea, so I will say that my favorite will be yours, lol. I love Lynette's Scandinavian Christmas. Wow, that's a lot of Christmas! I feel my brain melting already! I loved the Spearmint Funky Christmas, so I'm guessing you did too! Thanks for the great giveaway! I think though that you would pick O' Tinsel tree. I'm guessing Flurry Fat Quarter Bundle Kate Spain for Moda Fabrics. Thanks for the chance! I would guess Spearmint Funky Christmas Fat Quarter Bundle by Michael Miller Fabrics. At least it is one I would pick. Also love the Grinch ones! Fantastic. It is hard enough picking my favorite, so I will just have to guess for you. I love anything by My Sister and Me, so I will guess Ready Set Snow. Thanks for the chance to win. Christmas time by Alexander Henry. I LOVE that one!! I'm going to go with Countdown to Christmas from Sweetwater! My guess is count down to Christmas, although I think it would really be hard to choose just one. I've noticed that you seem to like to use bright, clean colours in your a lot of your projects so I'm going to guess Over the River by Barbara Jones. I am guessing Flurry by Kate Spain for Moda Fabrics! Thanks for the fun! Tough one! I am going to guess "I Love Snow Fat Quarter Bundle Shelly Comiskey for Henry Glass Fabrics "
My guess is Countdown to Christmas! OK, my guess is Spearmint Funky Christmas! My second guess ( which of course doesn't count :-) ) would be Flurry. I have so many Christmas fabrics now, I'm trying not to like any of the new ones.....not working, of course. Isn't that store amazing?!?! I'm going to guess Countdown to Christmas, only because it is my favorite and we have similar taste in fabrics. It's hard because the designers are really putting out some fabulous lines. I'm going to guess Deck the Halls, there are so many great ones. Wow...that's really hard...they are all awesome...I have a hard time picking which one I like the best! So I will guess on of my favorites...Flury by Kate Spain. I am only beginning to 'know' you... so my guess is Holiday Celebration because of the beautiful bright colours!! So you! I think your favourite fat quarter bundle in the Christmas Cloth Store is Spearmint Funky Christmas by Michael Miller Fabrics - such lovely bright colours! I'm going to quess Santa's Little Helpers. I'm probably wrong but I'm leaning toward Ready Set Snow! My guess is One Crazy Christmas Eve Fat Quarter Bundle seeing you like bright colors and dots. No clue what you would pick...but since I'm a Kate Spain fan I'd pick Flurry! My guess is the fat quarter bundle of "Flurry" by Kate Spain, because I remember when you first met her. If I'm remembering correctly, you liked her haha. I can't even choose my favorite, let alone yours! But I'll guess Spearmint Funky Christmas from Michael Miller. 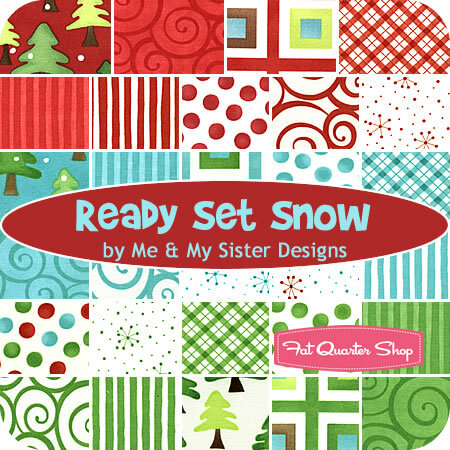 I have no idea but I am guessing Ready Set Snow by Me and My Sister Designs. I sure do love the look of it! I think you'd pick Spearmint Funky Christmas from Michael Miller. I pick Ready Set Snow.. I love it too! I say it's Ready Set Snow, such bright colors and something I think you would choose. Thanks for the chance. Wow, I can't believe so many beautiful collections are already out there! I'm going to guess ITB Winter Solstice. I already have Erin Michaels's Santa's Little Helper on preorder...I have 3 little girls 5 and under and they love Funky Monkeys and Monkeyin' Around. I'm going to guess at I Love Snow Fat Quarter Bundle, Shelly Comiskey for Henry Glass Fabrics but it was really hard as there are SO MANY! Wow, there are so many beautiful bundles. I'm going to guess Countdown to Christmas. Heather Mulder Peterson. Maybe it's yours, too? Wow! There are so many to choose from...I'm choosing Over the River by Barbara Jones. I'm going to guess Isabelle Christmas Anna Griffin Fabrics. And in five minutes from now I'll probably change my mind but I will resist the urge to come back and amend my guess. Anytime I've changed my mind it never fails that my first guess was right. LOL Thanks for the giveaway though even if I am way off. Ahhh come on Vickie...there must be 100 bundles...and I haven't got a CLUE! !...SEWWWW I am going to go with my favourite which is The Scandinavian Christmas!! LOVE it!! What a fun idea, my guess is Ready Set Snow. It just looks like you. This is very difficult. There are so many great lines. I am guessing Flurry by Kate Spain. Thank-you for this fun giveaway. So many great choices! Maybe "Christmas Candy"? I'm sure it's Ready, Set, Snow! Since I typically like your taste of fabric I going with something I really like, Spearmint Funky Christmas. Hope it is one you like too. Great timing! And I do think The Fat Quarter Shop always has such a great collection of beautiful Christmas fabric too. As to your favorite what a challenge. I'm off to hire a psychic, but I'll take a guess - Scandinavian Christmas. My guess is Ready Set Snow. It's so beautiful and bright! I think Ready Set Snow. I changed my mind. I guess Ready Set Snow! My guess for you is One Crazy Christmas Eve as your favorite Christmas bundle this year. Bright, fun and varied. Christmas Time by Alexander Henry Fabrics. I'm thinking it's Christmas Candy, but they're all so yummy! 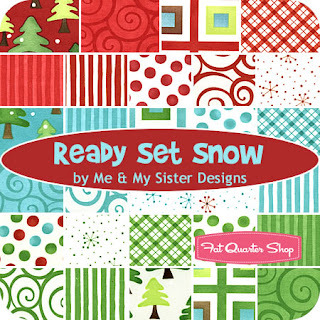 I think you like Ready, Set, Snow by Me and My Sister Designs! I like that one too. One crazy Christmas Eve...~it's fun and colorful! My guess is Countdown to Christmas. I know you posted about it previously. I'm going with Spearmint FUnky Christmas. Crossing fingers! Is it Ready Set Snow by Me and My Sister? That's difficult, but I'll say Ready, Set, Snow. Also, love your doll quilts you did for Easter! Oh my gosh. There are so many great choices, I've changed my mind about five times. But I'm going with "Flurry", by Kate Spain. Crossing my fingers!